Welcome to the Wholistic Self Wheel! To learn about the parts that make up your Wholistic Self, see All Our Beautiful Bodies. 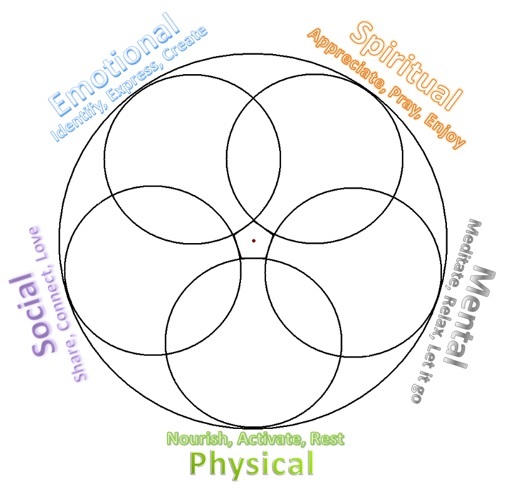 This wheel is used to determine which of your subtle bodies are most effected by your activities, and which of your bodies are lacking for stimulation, with an eye for bringing balance to your Self as a whole. It will also help you to increase your positive, happiness-promoting behaviors while decreasing unhealthy or detrimental habits. It is a tool for you to use as you see fit, to map out where to put your energies to create more happiness and fulfillment in your life. You can print this chart off by enlarging the above image and downloading it to your computer. Sit down at a writing surface with a handful of colored pencil crayons. Give yourself at least 30 minutes of distraction-free time in which to complete this chart. For each activity you perform, decide which of your subtle bodies you are supporting or subtracting from. It may be easiest to begin with your daily activities, starting when you wake up, and work your way through a typical day. You can give each activity a number if you want to quantify them. I usually give them a number to represent the hours I spend performing the activity in one week, or a number that represents how good or bad for my happiness I believe the item is. For example, let’s start with breakfast. 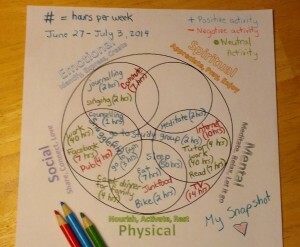 Eating feeds your physical self, so you can include it in the physical circle on the chart. Maybe you also eat meals with your family or roommates, making it a fun social event – if this is the case, write something like ‘eating together’ across the physical and social areas. There are activities that are good for many subtle bodies, like exercise, playing outdoors, or doing yoga (which can be good for all the bodies). 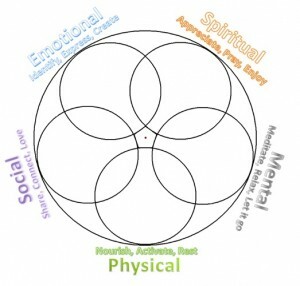 Write them in or across multiple circles to represent how they sustain you. We can improve our overall happiness by engaging in activities that fulfill many of our parts at once, while reducing the amount of time spent at negative activities, or neutral activities that do not bring us any lasting value. Once you have worked your way through a typical day, add weekly or intermittent activities to your chart and give those activities numbers to reflect how they improve or remove from your health and happiness. See the sample Snapshot above for a visual suggestion of how to fill out this chart. Activities are an easy place to start, but we are also affected by our thoughts, feelings and beliefs. 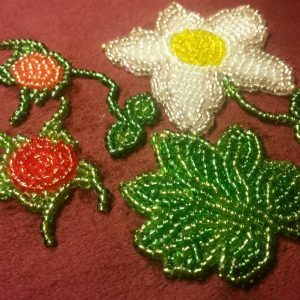 These are important to include on your chart, as they definitely effect your happiness! At first you may not know many of your own thoughts, feelings and beliefs, or how they are effecting you. You will learn more about them with time, so don’t worry about it now if they are not obvious to you. If you are unsure about these parts it is best to work with a counselor who can help you become aware of your thoughts and feelings and encourage thoughts that lead to positive change. As an example, a common belief in depression is something along the lines of, ‘I’m not a good person’ or ‘I’m not lovable’. This kind of belief can have a huge negative impact on your life, effecting many of your subtle bodies. Any thought, feeling or belief you want to change can be included on your chart. Write it out so you can look at it in the daylight; it’s something you can change. Don’t forget to put positive beliefs and emotions on the chart as well when appropriate; for example, maybe your love for your pet or a friend is a motivating factor in your life that improves your happiness in many subtle bodies. Feeling close with a loved one can be positive in a social, emotional, physical or even spiritual way! 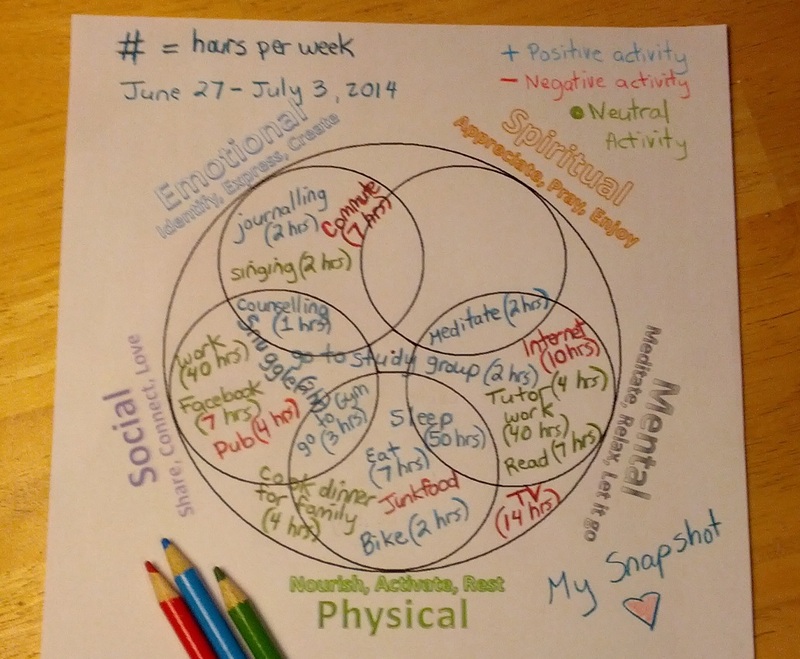 For more ways to balance your Wholistic Self, see part 2 of this post. Thanks for reading!